You know your film is in trouble when the usually entertaining cameo of Marvel head honcho Stan Lee falls flat. The latest cameo arrives after a furious, kinetic start to Marc Webb's "The Amazing Spider-Man 2". The cameo and the film barely register. "Amazing" is underwhelming, a frisky, unruly cartoon not a solid superhero drama. Three men in New York City want your attention: Max (Jamie Foxx) is unhappy that his tireless work at corporate behemoth Oscorp has gone unacknowledged. As Electro, an electronic ape gone nuts, Max makes Oscorp and the world take notice. He idolizes Spider-Man (Andrew Garfield), who has again lost the public trust, and Spider alter-ego Peter Parker is casually indifferent to girlfriend Gwen (Emma Stone). Peter has lost scientist dad Richard (Campbell Scott), and Oscorp's new owner Harry (Dane DeHaan) is dying, betrayed by the company's old guard. The three men have major emotional issues. The way they attempt to solve them is hardly good for humanity, the environment, or themselves. All in all "The Amazing Spider-Man 2" looks exhausted, emotionally flat, wandering through the motions and biding time until its next installment. Incidents that warranted a strong response left me cold. Even the crowds witnessing the electric light show that engulfs Times Square (an event covered by only one NYC television network in the film) look bored and robotic. I was nonplussed by it all, left empty by the most spectacular superhero disaster since "Green Lantern", or maybe "Spider-Man 3". The wink-wink humor that worked in Mr. Raimi's first two Spider films hasn't in Mr. Webb's second. Aunt May's (Sally Field) nursing secrets and Peter's laundry gags fall flatter than IHOP pancakes. Peter has become a Queens hipster, and a selfish high-school graduate. Valedictorian Gwen has her sights set on Oxford University. Will she throw that Oxford opportunity away to stand by her New York man? Ms. Stone has been the truest portrayal of the rational girlfriend, to Spider-Man, a confident woman who makes her man see the light. Yet she is barked at by Spider-Man this time, and puts up with entirely too much. I asked myself why, and couldn't come up with an answer. In the previous Spider film the lovey-dovey duo were sublime. This time, Ms. Stone and Mr. Garfield barely register in their scenes together. Worse than all of these things is the dialogue. In a superhero film how many original things can one say? How much pathos-laden dialogue can you stuff into a movie? None of this multi-million dollar voltage fest emits excitement or energy. Even worse than the dialogue is the annoying product placement, bad enough in a decent film. Repeated shots of the VAIO logo on Sony laptops, albeit in a film released by Sony, is downright irritating. Each time I saw VAIO it threw me out of the film and into a commercial. Independent of that, this new "Spider-Man" is a marketing product or brand rather than a standalone film. 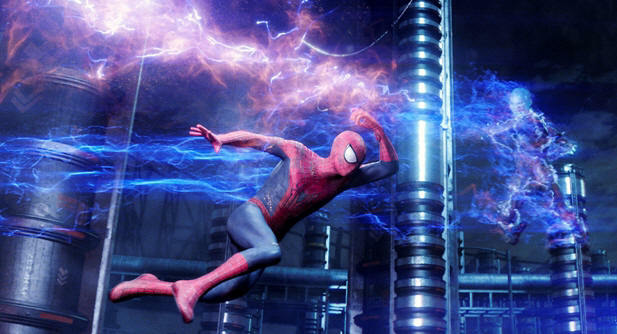 "The Amazing Spider-Man 2" looks like a pitched rough cut shown to the executives who signed off on it. "The Amazing Spider-Man 2" isn't a film I enjoyed. Mr. Webb give us no time to connect with a wise-cracking Spider-Man because, among other things, the hero talks even faster than he spins webs. Everything he says or does is at 400 miles an hour. The pace and tone are sometimes oddly contradicting. Several sequences give us near-slow-motion shots of a floating, balletic Spider Hero and seconds after he's pinging from pillar to post like a pinball. The film places its Spider symbol as some hallowed empire of authority and Spidey-ness but its imagined grandeur mocks the Spider-Man name and franchise. With this specific film the Spider-Man tradition is marred, set back several decades. A scene that recalls the memorable episode in Tiananmen Square of almost exactly 25 years ago ends up in "The Amazing Spider-Man 2" but all I could think of as I watched Mr. Webb's film was Batkid, a fictional character inhabited by a real-life courageous hero. Batkid captured the imagination and hearts of many millions last year. All of the choreography, stagecraft and theatrics of Batkid were so much more entertaining and exciting than the multi-million dollar special effects thrown at the screen in Mr. Webb's troubled, miserable mess. Also with: Chris Cooper, Colm Feore, Felicity Jones, Paul Giamatti, B.J. Novak, Sarah Gadon, Embeth Davidtz, Marton Csokas. "The Amazing Spider-Man 2" is rated PG-13 by the Motion Picture Association Of America for sequences of sci-fi action/violence. The film's running time is two hours and 20 minutes.